Lineage. 466th Bombardment Squadron (Heavy) (constituted on 9 Jul 1942; activated on 15 Jul 1942; inactivated on 1 Apr 1944) consolidated (19 Sep 1985) with the 166th Liaison Squadron (Commando) (constituted on 9 Aug 1944; activated on 3 Sep 1944; inactivated on 3 Nov 1945) and the 966th Airborne Warning and Control Training Squadron (constituted 966th Airborne Early Warning and Control Squadron, and activated on 18 Dec 1961; organized on 1 Feb 1962; inactivated on 31 Dec 1969; redesignated 966th Airborne Warning and Control Training Squadron on 5 May 1976; activated on 1 Jul 1976). 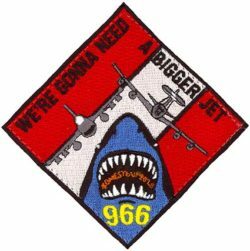 Redesignated 966th Airborne Air Control Squadron on 1 Jul 1994. Assignments. 333d Bombardment Group, 15 Jul 1942-1 Apr 1944. 1st Air Commando Group, 3 Sep 1944-3 Nov 1945. Air Defense Command, 18 Dec 1961; 551st Airborne Early Warning and Control Wing, 1 Feb 1962; 552d Airborne Early Warning and Control Wing, 1 May 1963; 551st Airborne Early Warning and Control Wing, 1 Jul 1969; 552d Airborne Early Warning and Control Wing, 15 Nov-31 Dec 1969. 552d Airborne Warning and Control Wing (later, 552d Airborne Warning and Control Division; 552d Airborne Warning and Control Wing; 552d Air Control Wing), 1 Jul 1976; 552d Operations Group, 29 May 1992-. Stations. Topeka, KS, 15 Jul 1942; Dalhart, AAFld, TX, 22 Feb 1943-1 Apr 1944. Asansol, India, 3 Sep 1944; Yazagyo, Burma, 13 Nov 1944; Inbaung, Burma, 12 Dec 1944; Asansol, India, 19 Dec 1944 (detachment operated from Arakan, Burma, c. 29 Dec 1944-23 Jan 1945); Sinthe, Burma, 4 Feb 1945; Asansol, India, 14 Mar 1945; Ondaw, Burma, 29 Mar 1945; Meiktila, Burma, 5 Apr 1945; Toungoo, Burma, 27 Apr 1945; Asansol, India, 14 May-6 Oct 1945; Camp Kilmer, NJ, 1-3 Nov 1945. McCoy AFB, FL, 1 Feb 1962-31 Dec 1969. Tinker AFB, OK, 1 Jul 1976-. Aircraft. B-17, 1942; B-24, 1942-1943. C-64, 1944-1945; L-5, 1944-1945. RC-121, 1962-1963; TC-121, 1962-1963; EC-121, 1963-1969. WC-135, 1977-1979; E-3, 1977-. Operations. Replacement training, Aug 1942-Nov 1943. Evacuation and light transport services for ground forces in Burma, 13 Nov 1944-10 May 1945. Airborne radar surveillance, 1962-1969. Rotated aircrews to Southeast Asia, c. 4 Apr 1965-c. Dec 1969. Trained aircrews 1977-. Decorations. Air Force Outstanding Unit Award with Combat “V” Device: [15 Nov 1969]-31 Dec 1969. Air Force Outstanding Unit Awards: 1 Jul 1961-30 Jun 1963; 20 Oct-30 Nov 1962; 15 Apr 1965-1 Jul 1966; 2 Jul 1966-1 Jul 1968; 1 Jul 1977-30 Jun 1978; 1 Jul 1978-30 Jun 1980; 1 Jul 1982-30 Jun 1984; 1 May 1985-30 Apr 1987; 1 May 1987-30 Apr 1989; 1 Dec 1989-1 Dec 1991. Republic of Vietnam Gallantry Cross with Palm: 1 Apr 1966-31 Dec 1969. Emblem. Approved on 15 May 1989 replaced emblem approved on 14 Jun 1963.